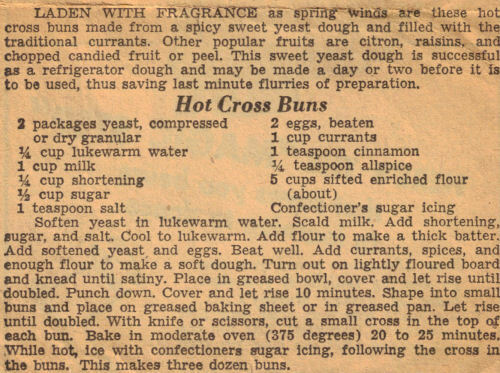 This vintage recipe was clipped from a newspaper and found in a large collection, date unknown but I would guess 1940’s – 1950’s based on the information on the back. Recipe is typed below along with a scanned copy. LADEN WITH FRAGRANCE as spring winds are these hot cross buns made from a spicy sweet yeast dough and filled with the traditional currants. Other popular fruits are citron, raisins, and chopped candied fruit or peel. This sweet yeast dough is successful as a refrigerator dough and may be made a day or two before it is to be used, thus saving last minute flurries of preparation. Soften yeast in lukewarm water. Scald milk. Add shortening, sugar, and salt. Cool to lukewarm. Add flour to make a thick batter. Add softened yeast and eggs. Beat well. Add currants, spices, and enough flour to make a soft dough. Turn out on lightly floured board and knead until satiny. Place in greased bowl, cover and let rise until doubled. Punch down. Cover and let rise 10 minutes. Shape into small buns and place on greased baking sheet or in greased pan. Let rise until doubled. With knife or scissors, cut a small cross in the top of each bun. Bake in moderate oven (375 degrees) 20 to 25 minutes. While hot, ice with confectioners sugar icing, following the cross in the buns. This makes three dozen buns.